The dust has settled after the shake-out of 2004, when Germany’s part-state-owned Landesbanks were stripped of their state guarantees by a European Union competition directive. German banks still hold three of the coveted top-10 spots on the list of the world’s safest banks while the top-five banks remain the same as they were last year. Britain’s Barclays Bank has provided the only significant change in the upper echelon of the list, vaulting from ninth to seventh, edging past its local rival Lloyds TSB and the Swiss giant UBS in the process. While Lloyds TSB’s three-spot slide down the rankings is the result of its Fitch rating slipping from AA+ to AA, Barclays passed UBS only by growing its asset base to a gargantuan $1.73 trillion, just surpassing UBS’s $1.67 trillion. The only new entrant to the top 10 is Wells Fargo, which nudged out France’s IXIS Corporate & Investment Bank and gave the US its first showing for many years among the world’s 10 safest banks. Wells Fargo’s climb through the ranks of safest banks has been remarkable: Just three years ago it was near the bottom of the list of 50. Spain’s Banco Santander Central Hispano performed the most startling leap up the table. Having just missed squeezing in at 50th last year, Santander, as the rapidly expanding banking group prefers to be known, leapt to 30th place on the back of an S&P; upgrade from A+ to AA-. As always, we have constructed our ranking based on size and credit quality. We began with a pool of 500 of the world’s largest banks by asset size to which we applied ratings from Fitch Ratings, Moody’s Investors Service and Standard & Poor’s, with appropriate weightings. For banks that had ratings from only two out of three agencies, one was inferred for the third, but with a penalty applied. 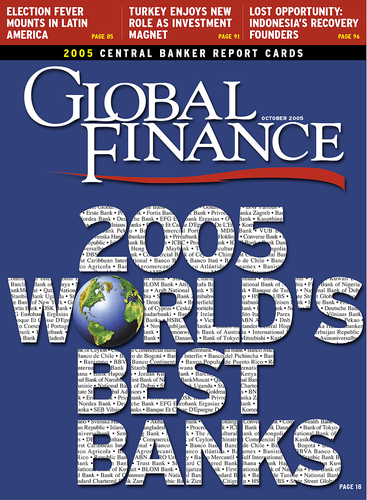 Banks with a rating from only one of the three agencies were excluded from the list. Where banks were rated equally by all three ratings agencies, or had equal inferred ratings, the largest of the banks was awarded the highest ranking.